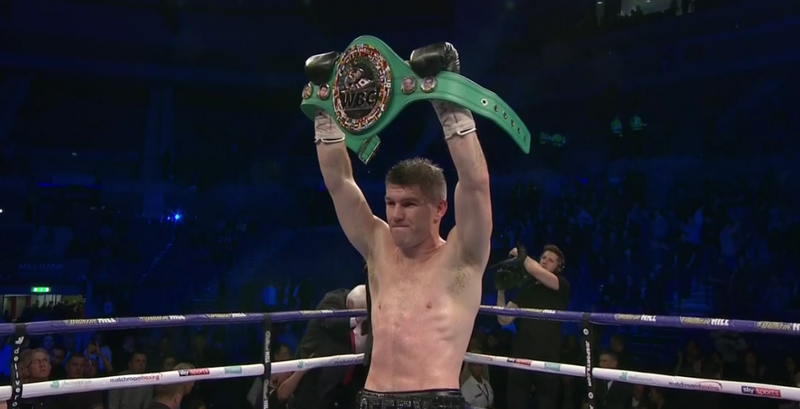 Liam Smith (27-2-1, 15 KOs) got back on the winning track on Saturday night in defeating Sam Eggington (24-6, 15 KOs) by a fifth round stoppage to claim the World Boxing Council Silver junior middleweight title at the Echo Arena in Liverpool, England. The referee Robert Williams had to pull the plug on the contest in round five when Smith trapped Eggington, 26, against the ropes and was pounding the stuffing out of him in hitting him at will. Although Eggington was technically fighting back, he was getting hit with massive shots one after another by the bigger, stronger Smith. The referee had no choice but to stop it. The fight was halted at 2:00 of round five. It was good match-making by Eddie Hearn, who promotes Smith and trying to get him in position for a world title fight. The WBC were kind enough to put their WBC Silver junior middleweight title on the line for the Smith-Eggington fight despite the fight being perceived as a bad match-up. Winning the WBC Silver 154 lb title now puts Smith, who isn’t ranked in the WBC’s top 15, within one fight of earning the WBC mandatory spot to fight WBC junior middleweight champion Tony Harrison or Jermell Charlo. Those two will be fighting a rematch this summer. In other boxing results on the card, British heavyweight David Price (24-6, 19 KOs) beat Kash Ali (15-1, 7 KOs) by a fifth round disqualification. The match was stopped at 2:26 of round five. The fight was stopped after the 27-year-old Ali, who was hurt at the time, pulled Price to the canvas, and bit him on the midsection. The referee stopped the fight at that moment and threw Ali out by disqualifying him. It was an inexplicable move on Ali’s part to bite the 35-year-old Price, because he had him hurt and in a state of exhaustion moments earlier. Ali had Price looking like he was ready to be knocked out when he had him against the ropes and was hitting him with big shots to the side of his head. However, the two were separated and the action was reset at the center of the ring. With Price looking ready to be knocked out, Ali got careless when throwing a long right hand, and he was countered by a monstrous right uppercut from Price that he didn’t see coming. The shot wobbled Ali, and him on unsteady legs. Price then attempted to finish the job, but he was taken to the canvas in a hard tackle by Ali. Once Ali had Price down, he bit him on his midsection in front of the referee. The fight was then stopped. Earlier in the contest, Ali had bitten Price on the arm in the second. In round three, Ali lost a point for throwing rabbit punches, He hit Price three times in the back of his head when he was in close. They were pretty blatant. Previous boxing news: RESULTS: David Price Wins Wild Fight With Kash Ali As Ali Is Disqualified For Biting!